His hegemony is participative and encouraging. He strongly believes and values taking everyone along the journey and his respect remains the same from the junior most to the senior staffs in the organization and outside. Which in turn makes everyone respect him all the more. One of the most remarkable thing which stands out in this journey is that Mr. Thampy have never compromised on work ethics or sought favors from any political outfit. This journey has been a successful one purely because of the perseverance he has shown over the years. From the humble beginnings in the 1980s, today Riya Group stands with an annual turnover of more than Rs. 11000 Crores and employs more than 2500 professionals. Riya takes pride in offering its customers responsive, competent and excellent services. Mr. Thampy understands the constant requirement to evolve and hence Riya has diversified into different businesses over the last few years and has been successful in such endeavours. Mr. Thampy’s vision is far from fulfilled and we’ve only scraped the surface. He keeps inspiring everyone by constantly raising the bar so as to unleash their true potential. It is his constant support, motivation and foresightedness that has managed to get Riya so far and will continue to do so. 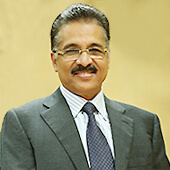 Mr. Jayan Nair has started his impeccable career in 1980 and has been instrumental in shaping the future of so many young talents in the field of Finance and Accounts. He currently is the Director - Finance. 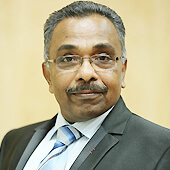 Mr. Jacob Varghese is a seasoned professional in banking and financial institution, with over two decades of experience and understanding of the complex and ever-changing policies and trends in the financial and lending arena. 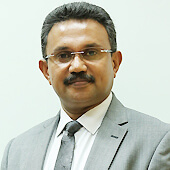 Mr. Varghese has played an integral part in the growth and development of the organization, sourcing the best financial and banking options, implement and improve policies and processes. person of good temperament, and great work ethics, with an assuming attitude to help everyone around him. Enjoys reading and world affairs. A business graduate, with exceptional organizational skills, passion for global events and great enthusiasm to try new things. His college training, a decade of experience and exceptional personal skills has resulted in the organization securing several international corporate accounts and organize global corporate retreats and incentive tours. 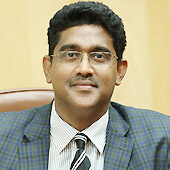 Mr. Nitin John has played a lead role in setting up Riya Holidays and organizing the MICE division. He has traveled across the world developing vendor relations and contracting with the service providers for the holiday’s division. 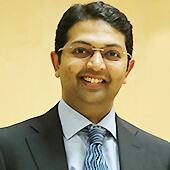 He holds a Masters Degree in Finance and have spent 10 years in Riya Group. He possesses a great skill of forecasting the industry trends and has always been proactive in his approach. He has a knack for technology and keen interest in all things related to automobiles. His knowledge and understanding for international destinations is what led to the success of the holidays division. He also enjoys watching world racing events, travelling and has a keen interest in sightseeing around the world and always evaluating options for the next event for his clients. With as much knowledge and experience as Mr. Mathai possesses, one is bound to be everyone’s go-to person for a quick reference in matters of the moment and others alike. Mr. Mathai is an academic by choice and a people’s person by nature. He has spent about 18 years with Riya and has been for about three decades in the aviation and travel industry and has served in various levels of in the management. Mr. Mathai has from inception, taken a keen interest in the development of people’s skills, both academically and socially. Setting up the Riya Education services, which helps Indian students pursue their studies abroad & Riya Institute of Hospitality and training facility which makes students travel industry ready are few of the many initiative he has taken in past several years. With more than 25 distinction and academic degrees and certificates to his credit, still enjoys continuous education and likes to keep himself updated in industry standards and procedures. An avid reader with a passion to travel different places of ancient history in education and cultural interests. He is a guest orator and enjoys sharing his knowledge and skills to develop young talents as future leaders within the organization. He has earned several awards and recognition for his continuous hard work. A technocrat with a keen interest in integrating modern technology and gadgets into everything he believes in and is challenged with. Mr. Samuel who holds a Masters degree in business management, likes sports, music, technology and marketing. Throughout his career he has been an apolitical person. He is the perfect mix of technology and aviation industry with 18 years of experience in both. Being a person of great interpersonal skills and strong personality, bringing people of different skills and thought process together to harness the best in them is just second nature to him. 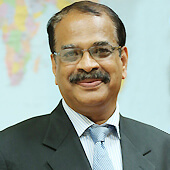 Mr. Samuel has played a vital role in transforming the organization’s techno-advancement in every aspect and helped develop a wide array of travel related products and advancements in the mobile technology. He is always coming up with progressive ideas to incorporate in technology and modern industry practices into the organization. He also oversees the support functions in the organization providing ample support to Human Resources and Marketing department from his rich experience and insights of the industry. He has ensured the Human capital achieves the maximum. A tech-buff with a never-ending love for new innovations and always experimenting his ideas with these new inventions. He enjoys traveling, attending exhibitions and tech-shows, amongst other things, for leisure. He has a keen interest in photography and loves capturing the perfect moments within the frame of his camera.